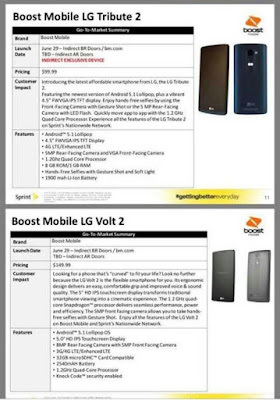 An anonymous tipster sent me a copy of a memo to Boost dealers revealing that Boost Mobile will be launching upgraded versions of the LG Tribute and LG Volt Monday, June 29 at Boost dealers and boostmobile.com. The new phones are the $99.99 LG Tribute 2 and the $149.99 LG Volt 2. Both will be running the latest Lollipop 5.1 version of Android and have other significant upgrades over their predecessors. Here are what we know of the specs. Where there are differences I've put the prior models specs in parentheses. The one obvious downgrade is the smaller battery on the new models. The biggest improvement is the HD screen on the Volt 2. The Volt seems to have the same specs as the recently launched LG G Stylo except for the smaller (5" vs 5.7") HD screen and 2540 vs 3000 mAh battery. I suspect that means the Volt 2's battery is removable and there's 8 GB internal memory and 1 GB RAM like the G Stylo. I'd really like to see 2 GB RAM for better multitasking in mid range phones like the Volt2 but doesn't seem like Boost is willing to give it to us yet. 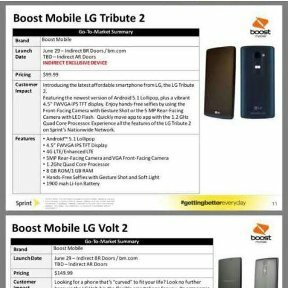 Update 7/20/15: Sprint announced today that the LG Tribute 2 will be available for $99.99 at Walmart for use on Virgin Mobile's Data Done Right plans. Sprint Prepaid will offer a version of the Tribute 2 called the LG Tribute Duo, also priced at $99.99. Thanks for another 'intriguing" albeit rumor-based post. While I own & enjoy my LG G2 (AT&T variant), I still carry my LG Volt (VM) to work and about town each day. It's got excellent battery life (3000 mAh), plenty zippy performance, and gives me LTE Spark data coverage where I live. If the Volt 2 makes its way to VM, I'm all in. You're right, of course, about the added benefits 2GB ram would bring. One of theses days they're going to get the specs just right for us cost-conscious smartphone users. "You work for Boost.." was in reply to someone else, not you. Lol, I work for boost too, and was curious as to when this would appear online. Thanks for the post bro. What does that have to do with anything this article is about? And Sprint Actually bought out Virgin Mobile in 2009. So virgin has everything to do with Sprint, considering they own the company. These 1.2GHz quad core processors are killing me! The single thread performance is terrible. Android only allocates a few hundred megabytes for each process heap - adding more memory may help you keep a few more background processes running, but it's not going to help your foreground user experience more than any other snapdragon 4xx handset released in the last 2 years. Qualcomm is sandbagging the prepaid phone industry with stale products! That atom powered zenphone 2 may be the only worthwhile upgrade this year if lenovo doesn't bring a snapdragon 6xx to the motog refresh. 1.2 quad core need to be upgrade to 1.4 or 1.5. All budget phones are coming with the same 1.2 quad core cpu. Its the most important upgrade to me. second only to the ram and rom. I'll get the LG Volt 2. better specs. LG Tribut 2 is tiny specs upgrade not even got any considertion from me. Does this mean the price of the first LG Volt will go down significantly? That woud be nice. Got mine water damaged, but would get another...Or upgrade to V2.